Newspaper Rock: Making Peter Pan authentic? Column: Play's 'authentic' Indians offensiveI teach a course on racism at UWMC. I also teach a course about American Indian and non-Indian contrasts. When I read the article in this paper about the local "Peter Pan" production, I grimaced as I read the part about making the Indians in "Peter Pan" "authentic." How can you make stereotypes "authentic?" That frankly makes no sense. Had there been no mention of this "authenticity" at all, I would not have given the production of "Peter Pan" a thought.And:It embarrasses me that the very idea of doing "Peter Pan" did not raise flags for me because a few years back I heard a presentation in which a couple had worked hard to make sure their children did not have stereotypes of any group. While in Florida, they took their kids to visit Seminole Indian offices. Later, their daughter told them that the Seminole people they met were not Indians. What did she mean? She pointed to the Indians in "Peter Pan" as being the real Indians.This anecdote is revealing. Adults (think they) can discern between real and fictional Indians. Maybe so, but children can't. They absorb what they learn from the media--media such as Peter Pan. The message they get is that "real" Indians are chief and braves in "feathers and leathers." And that real Indians--i.e., doctors, lawyers, middle managers--are fakes. Finally:Personally, I don't see how American Indians could be left in "Peter Pan" at all. I would substitute some fanciful creatures and re-write a lot of the "sacred" Barrie text. Or just choose something else to produce.Actually, the recent live-action Peter Pan movie did a decent job of making the Indians nonstereotypical and "real." If you buy the idea of Indians consorting with pirates and fairies on a magical island, you probably can't do much better than this. But as I've said before, the whole idea of placing Indians in a fantasy Neverland is problematical. Therefore, I agree with this writer. Replace the Indians with a fictional race--elves or Munchkins or whatever--and the story would work just as well. For more on the subject, see Tiger Lily in Peter Pan: An Allegory of Anglo-Indian Relations. 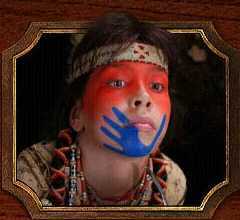 Below: A more authentic Tiger Lily from the recent Peter Pan movie.